So a couple of weeks ago I snagged a Brooks Nightlife hat on eBay to replace my ugly yellow RoadRunnerSports hat. In an instant twist of Karma, right after that I saw the Brooks Nightlife half zip on sale at RunningWarehouse.com so I pounced on it. 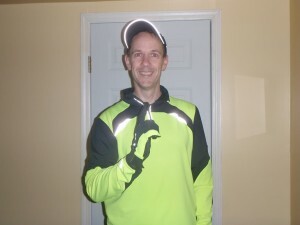 In my elation I ended up bragging to BrooksRunning on Twitter who was kind enough to send me a complimentary pair of Nightlife gloves. So my early morning outfit is now pretty complete – if BrooksRunning is reading, I seriously think you guys should be making Nightlife themed shoes. The Adrenalines would rock in neon. As it stands now, I think my shoe of choice for the Philadelphia Marathon will be the Brooks Ravenna. I have been sporting the Adrenalines pretty religiously but I think the Ravennas have a little more fore foot cushioning in them than the latest breed of the Adrenalines (although I have been trolling eBay hard for a pair of the older Adrenaline 8’s). 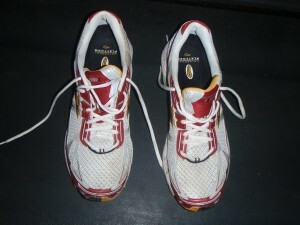 This is the pair I ran the Asbury Park Marathon in – I think they have another marathon in them. 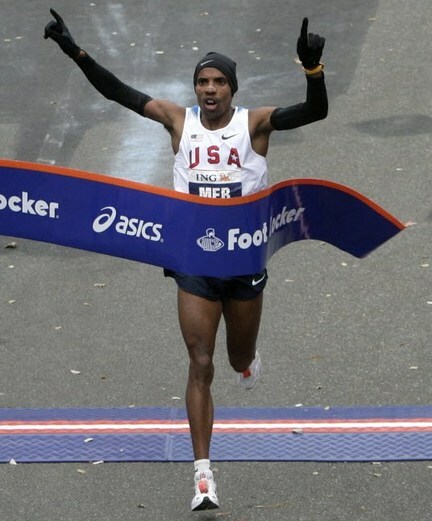 Congrats to Meb Keflezighi, first American man to win the NYC Marathon since 1982. I got home from a 16 mile run on Sunday just in time to turn on the TV and watch him blow by Robert Cheruiyot coming into Central Park. Awesome race! It was great watching Meb finish! I had tears in my eyes!! Free gloves just for Twittering? Dang, what I miss out on. Cool on you for the whole ensemble, you look smashing. Getting excited for Philly, too!! Butterflies can happen in a moments notice if I think about it, so I’m trying to put it in the back of my mind to no avail. What are you aiming for? I have those same gloves, I really like them. Also have the cap too! I like to think the cars see me.